The Barbie doll and Princess Disney Elsa from Frozen have been selected as hostesses to promote a new lemonade drink. They have to go to the mall to sell this new product in a stand and they must be dressed in a yellow outfit to go with the product. We will start with Elsa and we will select a nice combination of t-shirt and skirt or trousers so that she looks very pretty. When we finish, we will choose a hairstyle, a bag and some jewels to complement the look. When you finish, it will be Barbie' s turn with which you will have to follow the same steps as with the previous girl. Make them look awesome with their yellow outfits and sell a lot of lemonade to get more jobs with this brand. 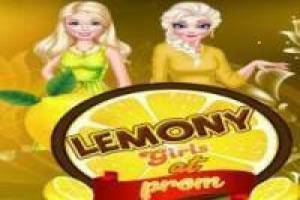 Enjoy the game Barbie and Elsa: Promoting lemonade, it's free, it's one of our barbie games we've selected.